View Awards Magical-Menagerie has won at this page. 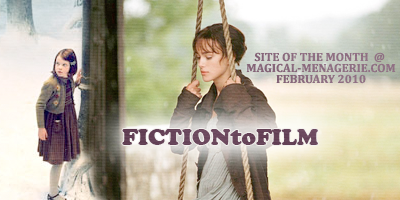 Fiction to Film is a website that celebrates books that are made into feature films. It follows all different books as they make the leap to the big screen. If you love movies and books then this is the site for you! The owner Claire, is a wonderful webmiss and is very passionate about the site and it shows. So make sure to check out the site! For our June site of the month I have chosen the best source for Tom Felton news, Feltbeats! Feltbeats is your number one stop for anything Tom Felton, from his music to the films he acts in! Be sure to check out the site! 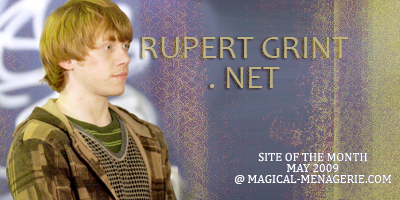 RupertGrint.net is one of the best sources out there for Rupert! They constantly update with the latest news and photos, and lets face it, who doesn’t love Rupert?! And we need to show Rupert major love because he seems to be left out of the trio alot! So visit the site! 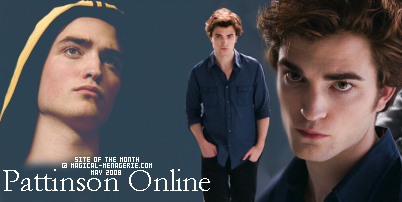 In honor of Robert Pattinson’s role in Twilight I have chosen Robert Pattinson ORG for the December site of the month. This site is one of the best Rob sources on the web with an awesome gallery, frequently updated news and more! Be sure to check them out! For the November site of the month I have chosen Ben Barnes Fan! This is the best source for all your Ben Barnes needs! Ben is most know for his role as Prince Caspian in Narnia *dies* (I love him, ha ha) He is also in Stardust and a bunch of movies yet to be released! So check out the site! Our October site of the month is I Heart Keira. This site is an awesome source for actress Keira Knightly who is most know for her role as Elizabeth in the Pirates of the Caribbean movies, but that is not even her best role. I happen to love her in Pride and Prejudice and can’t wait to see The Dutchess. Well enough rambling on her acting, this site updates frequently. They also offer lots of photos, information and much more! For September I picked a wonderful new website! The Harry Potter Collector’s Guide is a great place for people who like to collect all things Harry Potter (like me). They have an awesome, but still growing, database with information on tons of products. And also a forum, that I am a member of, that needs more active members posting! So visit the site and join the forums! 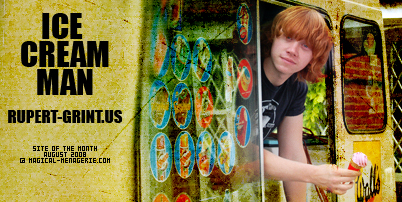 For August I chose Ice Cream Man (aka Rupert-Grint [dot] us). It is one of the best sources for Rupert Grint!! They have a wonderful gallery, frequently updated news and much much more! Make sure to check out the site, it is great! For July I chose Surpassing Time (aka Caspian and Susan [dot] com). 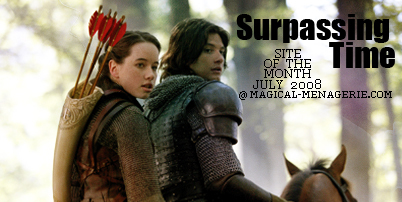 It is an awesome source for Ben Barnes and Anna Popplewell news and much more! If you don’t know, they are in the Chronicles of Narnia films It also supports the ship of Susan Pevensie and Prince Caspian. A must see site! 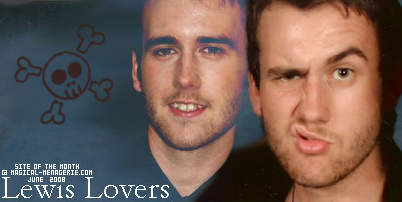 In honor of Matthew Lewis’ birthday this month, I have chosen the best and basically only Matthew Lewis fansite out there; Lewis Lovers! It has a great gallery with tons of screencaps, updates constantly, has lots of information and more! So go check it out! In honor of Robert Pattinsons birthday (which is May 13th) I have chosen Pattinson Online for the site of the month! It is, in my opinion, the best Rob site out there! They update constantly and they have an awesome gallery with over 10,000 images! So go check the site out! I thought it only fitting (since it is April, aka National Humor Month! 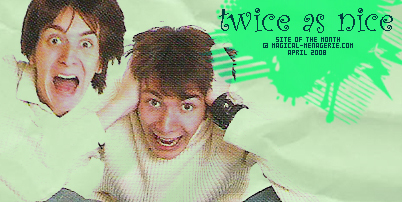 and April Fools day, which is also the Weasley twin’s birthday) to honor a James and Oliver Phelps site! I chose Twice as Nice, which is one of the best sites for James and Oliver! They update a lot and have lots of great content! Make sure to give the site a visit!!! I chose Codey Linley Web for my site of the month for March! This is a great source for Codey news, they are always updating with news and the site has an awesome layout and tons of other great stuff! So make sure to check it out! For the February site of the month I chose Katie Leung Fan! This is the best Katie site out there in my opinion. It has a really fun layout, updates news constantly and has lots more fun content. If you haven’t already seen it, check it out now! For the January site of the month I chose Miley Fans NET! A great site for fans of the talented Miley Cyrus! Make sure to check it out! For the December site of the month I chose a really unique site. 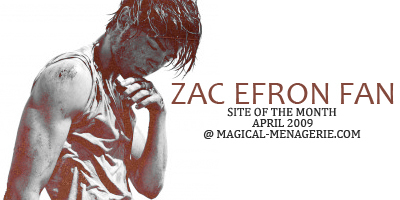 The Magical Pen is a great site that helps you write and send fanmail to your favorite actors! The webmiss is also raising money for a charity right now by selling some authentic autographs by many stars, including some Harry Potter ones. A definate must see! For the November site of the month I chose a great Shipper Site. Canon Love is a shipper site for Ron/Hermione and Harry/Ginny. They have tons of great information, news on all 4 actors, graphics, photos and tons more! Definatley a site to bookmark. For the October site of the month I chose a really unique Emma Fan site. Sassy! is a fashion site for Emma Watson, they find matches for all her outfits and some are even exact. I have been a fan of this site for a long while and it is really great. If you love fashion, or Emma’s style this is a great site to check out. They have matches, fun fan stuff, a wonderful forum (I am Megan on it) and more! I chose Pirates of the Carribean Web for my September site of the month for a few reasons. (1) I LOVE PIRATES! To admit, I love the Pirates movies more than the HP movies). (2) It is the best Pirates site out there, great graphics, news and much much more. And (3) I felt I should honor a non-Harry Potter site for once. Phelps Brothers Online is a new fan site devoted to the Phelps twins who, obviously, play Fred and George Weasley in the Harry Potter films. The site has an awesome layout, great news, and an extensive gallery with tons of movie screencaps. Check out this wonderfully wonderful site! Harry Potter Trio is a great Harry Potter site revolving around the trio. They have the latest news, a great gallery and more. They also have a wonderful layout! 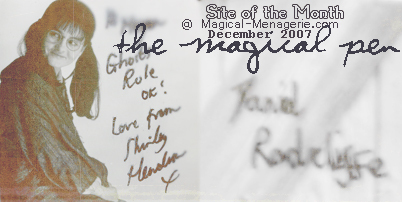 I have been a fan of their site since 2004, I even won a contest for Goblet of Fire! So check them out! Ron and Hermione Source is a wonderful shipper site for Ron and Hermione. They have a great layout, update their news constantly, have tons of information, pictures and more! Make sure to check out the site! Awkward is a great shipper site for Neville and Luna. There is information on each of the characters as well as the actors. There are also videos, graphics and other information to support the ship. Check it out! The site is wonderful, I really enjoy visiting it..
Evanna Lynch Online is a wonderful website about Evanna Lynch who plays Luna Lovegood in the Harry Potter Films. The site is run by my amazing Top Affiliate Sarah! She always comments on my news and even gives me news tips sometimes. Her layout is amazing with lots of cool brushes and colors. The site has tons of information, fun stuff, a great gallery and daily updates to the news(unless there is absolutely no news :p). Make sure to check it out! Bonnie Wright Online is a wonderful website about Bonnie Wright who plays Ginny Weasley in the Harry Potter Films. They have a beautiful layout that I adore and they have great site extras such as a gallery, great news, graphics, information on both Ginny and Bonnie and so much more. Make sure to check it out!